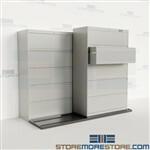 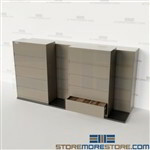 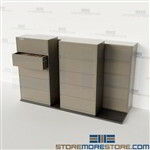 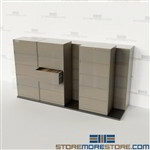 Lateral file cabinets on tracks save space in your office and provide better accessibility. 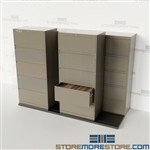 By sliding back and forth, the cabinets maximize your available storage and use less floor space. 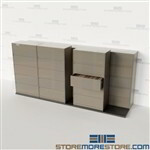 Multiple sizes and configurations are available depending on your needs. 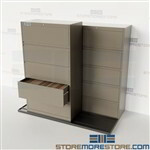 Floor rails support letter and/or legal filing. Call us toll free at 1-855-786-7667 or send us a message for more help.